It may not have been a Huntington Look (Obamsick, The Big Yearpg. 175), but we all saw the sparrow pretty well perched at the top of the Burning Bush, surrounded by at least ten of it’s plebian House Sparrow cousins. James Huntington had met us this morning at 8:00 AM in the lobby of the Coralville Super 8 to try for Eurasian Tree Sparrow. It was great to see James again. We searched at a spot along the Iowa R. only a ½ mile from the motel, but without any luck. So we drove southeast about 30 minutes to Cone Marsh. Though this bird isn’t common in Iowa, I had complete confidence that we would find the target. After all James Huntington, one of the leaders for the fabled Attours, was guiding us. 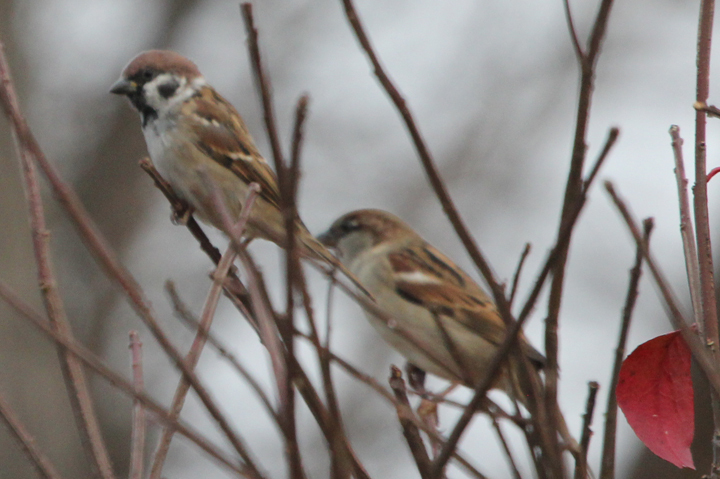 If he can find a Pin-tailed Snipe on Attu for Sandy Komito, he can find a little old Eurasian Tree Sparrow in Iowa, right? And we were not disappointed; year-bird #730 was seen and photographed. But despite this success, I was restless. James had another pearl of information for me, a farmer in north central Iowa had confided in James that Gray Partridge were on his farm. But I first needed to hustle my brothers back to Chicago for a Citizens For Conservation workday. CFC is a private conservation organization that is using volunteer labor and expertise to restore native prairie, marsh and woodland habitat to its nature preserves. CFC has had great success in attracting birds to its properties, and has created living space for such rare butterflies as the Eyed Brown, Black Dash and Dion Skipper in its restored sedge meadows. CFC has even attempted a reintroduction of native fish to its rejuvenated prairie slough. Some enthusiastic followers of my blog have pledged donations to CFC for each species I tick! If you’re enjoying this blog, please consider donating to a worth conservation clause. After the mornings success, James sent us on our way back to Chicago loaded with sandwiches and margaritas (not to be tasted till we were safely back in Chicago). We arrived at 2:30 PM. After discussing the Gray Partridge situation on the phone, I hopped back in the car and drove 350 miles to Mason City. Tomorrow I try for Gray Partridge. I’m moving fast, stay tuned. Geese are turning up in the northeast. update the total on the top right! Okay, John, I enjoy your blog and Big Year effort, so I’ll mail $100 today to Citizens for Conservation, 459 West IL Rt 22, Barrington, IL 60010. That currently works out to 13.7 cents per bird. I am hoping you will bring that cost down by getting more birds by December 31! Looks as if they found this bird Sun., Nov. 6. Still there as of today. from the Artichoke Dairy on Rogers Street in West Newbury at 8:30 this morning. it until about 5:00 pm when we left. please respect the farmers wishes and do not trespass. Thanks to Phil Brown for posting the Barnacle Goose and getting the word out. through the day. Hopefully it sticks around for others to see! as if they were in middle of the forest. Seeing them in that setting usually produced a big “Wow!” from visiting birders. As requested, here’s my updated prediction for your final total: 735, maybe 736 or even 737. I’m figuring you have two “definites” left: Barnacle and Pink-footed Goose, and there’s about 11 to 17 likely vagrants. By “likely”, I mean there’s a relatively good chance of them showing up, but it’s still a small probability. Most of them will likely NOT show up, and I’m guessing maybe 3 will tops. When your in Mason City you might drop by Ventura, which is our sister city, but you won’t find any Allen’s Hummingbirds there…..